Closed: Win a Vonshef Ice-Cream Maker! This giveaway is now closed and the winner will be announced soon. You’ll be able to whisk up ice-cream, sorbet or frozen yoghurt in next to no time, with this fabulous VonShef Ice-cream maker! You can’t beat the taste of home-made ice-cream or sorbet, but making them by hand is such a chore. To get a really smooth consistency, you need to beat the mixture every so often during the freezing process. Try to cut corners, and you’ll get large ice crystals in the finshed product. But making your own ice-cream, sorbet or frozen yoghurt is quick and simple using the VonShef ice-cream maker. This clever machine can whisk up a quick dessert in just 20-40 minutes. It’s easy to use and with such delicious results, the hardest part might be deciding what flavour to make! Read on to find out how to win a VonShef ice-cream maker of your own! The VonShef ice-cream maker is perfect for making your own frozen desserts at home. As well as tasting great, this also allows you to make organic or dairy free desserts, as well as avoiding additives and preservatives. 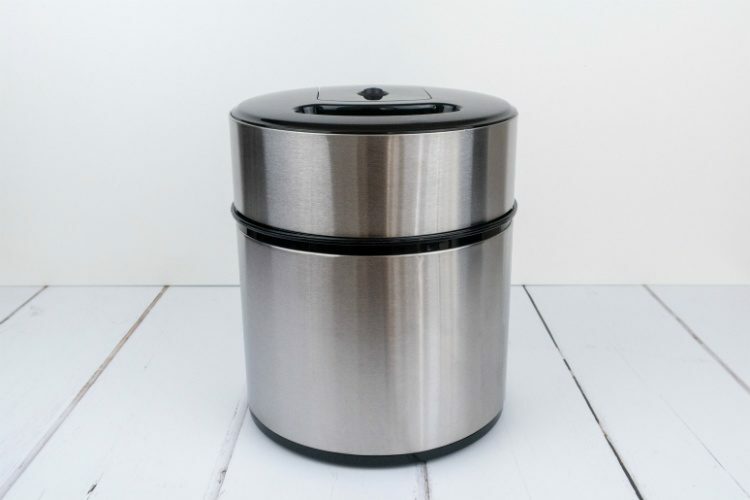 It has a sleek stainless steel case that looks fab on your kitchen top, so you could easily leave it out for regular use, especially in the summer months. But if you want to store it in a cupboard, it won’t take up masses of room. The double wall insulated inner bowl and large mixing paddle create smooth, soft ice-cream while the reversible motor sweeps the paddle in alternate directions to stop the mixture becoming too thick. And the chute at the top so that you can add flavours or ingredients into the mix while it churns. This machine that will make 2 litres of ice cream, sorbet or frozen yoghurt. That’s perfect for families, dinner parties or to make a batch of ice-cream to store in the freezer. And the removable bowl makes serving your ice-cream and cleaning the bowl afterwards really easy. Making frozen desserts in the VonShef Ice-Cream Maker is oh-so simple. You do need to pre-freeze the inner bowl for at least 8-12 hours before you start. So it’s a good idea to store the bowl in the freezer in between uses, so that it’s always ready when you want it. And for best results you should chill all of your ingredients before use. When you’re ready to make your ice-cream or sorbet, simply put the inner bowl in the ice-cream maker, and fit the paddle into lid of the machine. Once you’ve put the lid onto the base of the machine, and switched it on, you simply pour your mix into the bowl through the chute in the top. You only need to use about 500-750ml of mixture to create 2 litres of dessert. When the mixture is starting to freeze, you can add any other flavourings or ingredients into the mix through the chute. And when your ice-cream, sorbet or frozen yoghurt is ready, you simply need to switch the machine off, lift out the inner bowl, and serve! You can store any leftovers in the freezer, although the consistency will get firmer as you store it. The VonShef Ice Cream Maker is available to buy online, RRP £27.99. And one lucky SallyAkins.com reader will win a fabulous VonShef ice-cream maker! For your chance to try this fantastic kitchen gadget for yourself, simply log into the Rafflecopter below and answer the easy question. There are also some bonus social media entries that you can use to boost your chances of winning. The giveaway will close at 11.59PM on Friday 15th February, 2019 and is open to UK entrants aged 18+ only. What’s your favourite flavour of ice-cream? Vanilla is my favourite flavour of ice cream. I love toffee ice cream! Would love an icecream maker. I would make rum raisin! What is your favourite flavour of ice-cream? Chocolate ice cream is my favourite. This would be a life saver if we have another summer like last year. Chocolate is my favourite flavour. My favourite icecream flavour has to be chocolate. . I cannot lie! I love a salted caramel. In fact I’m salivating just thinking about it. Vanilla is my favourite, but strawberry is a close second. i LOVE CHOCOLATE THE MOST! Ooohhh Chocolate chip with fudge! Mint choc chip! Or if it’s homemade, orange & chocolate! Strawberry, when it’s made with real fruit and cream. Yummy! I love all ice cream but mint choc chip is my favourite! I love chocolate ice cream. My favourite flavour of ice cream is a really good vanilla. My little girl would love to make homemade ice cream. Mint choc chip is my favourite!! Hokey Pokey ice cream (New Zealand’s most popular) is my favourite flavour. They have the best ice cream in the world. My favourite is chocolate with banana and chocolate chips. Chocolate Mint is my all time fave. Mint choc chip is my favourite flavour. I love mint choc chip! Salted Caramel is the best! I love hazelnut ice cream! Pistachio is a close second. Vanilla – although I’d like to make one with cheeky bits of strawberry in it! Chocolate used to be my favourite but sadly I’m allergic to dairy. I’d use this ice cream maker to make all the dairy free flavours I’ve missed out in all these years! Raspberry ripple has been my lifelong favourite. I know it sounds boring but vanilla! I love strawberry ice cream! My favourite ice cream flavour is ginger. My favourite flavour is plain vanilla. I love Chocolate ice cream & vanilla ice cream mixed with brownies and chunks of chocolate chip cookie dough.It really tastes so good. I can’t choose between my two favourites coconut and vanilla! Both equally delicious. I absolutely love pistachio ice cream – it’s yummy! Has to be mint choc chip – also I would love orange but you don’t see it very often. Plain old vanilla is my favourite flavour. Coconut ice cream is my favourite! I’d have to say my favourite flavour ice cream is raspberrry ripple, especially on a hot sunny day! I can buy tablet flavour in my local supermarket, its awesome!! My favourite flavour of ice cream is caramel. I like Vanilla flavour of ice cream. It has to be mint chocolate chip, l love the refreshing mint and it being cold seems to enhance it. I love vanilla flavour ice cream! Strawberry with real strawberry chunks. Ooh, it’s got to be a blend of strawberry and chocolate! Vanilla is my favourite, strawberry a close second. I love salted caramel – although I prefer sorbet to ice-cream. The sharper the better! I love pistachio flavour ice cream, but it’s really hard to find in the UK. I love salted caramel ice cream – yum! I like vanilla especially with a nice desert like apple pie. I adore pistachio but hazelnut comes a close second. Salted caramel is favourite at the moment but still love simple vanilla too. A good vanilla bean ice cream is hard to beat. I’ve always loved strawberry ice cream but I also enjoy the newer flavour Salted Caramel. Some lovely ideas!! Raspberry Ripple. I LOVE it! My favourite flavour of ice-cream is violet. Has to be raspberry ripple! My favourite ice cream flavour is chocolate. Mint choc chip ice cream is my favourite. Strawberry is my favourite flavour! I absolutely love ice cream!!!! Strawberry is the best! I LOVE coffee flavour ice cream, everyone in our house hates it which means i get it all to myself!! Salted caramel was my favourite until Oreo converted me! Chocolate fudge brownie is my fave flavour. But I dont discriminate I mean icecream is icecream and all are lovely at the end of the day. Chocolate is my favourite. Especially if it has pieces of chocolate in there too! It’s got to be strawberry- especially with strawberry pieces in it! I used to work in an ice cream parlour with so many different and whacky flavours of ice cream, yet still more often than not customers chose vanilla! I understand this now I’m older and do like a good vanilla but my ultimate fave is rum and raisin. My favourite ice cream flavour is vanilla!! I love my home grown strawberries with ice cream in the summer so it would be great to make my own ice cream too!! Chocolate is my favourite flavour of Ice cream. Thank you for a fabulous giveaway. I love coffee ice cream made with with cherries and dark chocolate chips mixed into it. Lemon Cream … had one whilst I was in Turkey, it was heaven! It has to be chocolate for me. Fancy Brand wise it’s Strawberry Cheesecake Ice Cream by a certain H-D. Otherwise I love Mint Ice Cream. Salted Caramel has to be my favourite! Mint Choc Chip is my favourite – it’s really yummy! I love ameretto cherry flavoured icecream. I would love to be able to make my own. My favourite is salted Caramel. Raspberry ice cream – my mother in law makes it when she has lots of berries in the garden. Harder to find these days but I love a chocolate ripple vanilla ice cream. My favourite ice-cream flavour is caramel! Totally scrumptious! I am a mint choc chip girl all the way! Raspberry Ripple…a favourite since childhood! It has to be double choc mint! Coffee which is surprising as I don’t drink the stuff. I love coffee flavour ice cream, it’s so hard to find it – there is only one supermarket (not local to me) that sells the branded name I love – I don’t like the supermarket’s own brand. I would love to be able to make my own. I don’t know why coffee ice cream is not readily available, it’s so frustrating. Pistachio is my ultimate favourite! Cookie dough is my favourite. I always thought plain Ice-Cream was Vanilla. I’ve recently learned that plain Ice-Cream is cream flavoured. Simply cream and when the ice-cream is made properly it is a delicious simple flavour, my favourite.